Clean, upgraded room. Very peaceful and quiet. Would go back again. Where to find Hemlock Valley hotels near an airport? Where can I find hotels in Hemlock Valley that are near tourist attractions? If you intend to vacation in Hemlock Valley, book your room as early as you can, because you won't find an abundance of hotel and apartment choices in close proximity to Hemlock Valley's center. One of only a small number of Hemlock Valley hotels close to the center of Hemlock Valley, is the Hemlock Hollow Condos. 12 kilometres (8 miles) away from the heart of Hemlock Valley, is the Harrison Lakeview Resort. Alternatively, the Harrison Beach Hotel can be found 12 kilometres (7 miles) away. 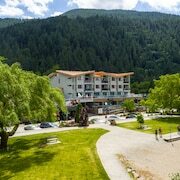 Alternative accommodation options include the Harrison Hot Springs Resort and Spa and the Fraser River Lodge. 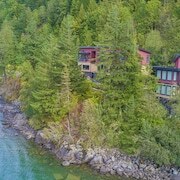 After you have enjoyed Hemlock Valley, why not take the time soak up more of the Vancouver Coast area. Vancouver Coast offers forests. Commonly visited Vancouver Coast tourist destinations include old towns. Locals and visitors alike in this part of Canada commonly enjoy snowboarding. Looking for more things to do? Why not spend the day discovering Tradex Trade and Exhibition Centre and Abbotsford Recreation Centre, which you'll find in Abbotsford, 45 kilometres (29 miles) to the southwest of Hemlock Valley. 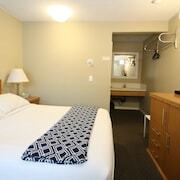 Abbotsford hotels include the Sandman Hotel & Suites Abbotsford and Travelodge Abbotsford. Alternatively, you could stay in Hope, 35 kilometres (21 miles) to the east of Hemlock Valley, where you can choose from the Travelodge Hope and Windsor Motel. Regardless of whether you're passing through or spending a few nights in Hope, set aside a little time to check out the Hope Golf Club and Kawkawa Lake Park. Before you say goodbye to Chilliwack, ensure you experience local game. Visit BC Place Stadium to the west of Hemlock Valley. Book accommodation close to the action at the Fairmont Pacific Rim or the Shangri-La Hotel, Vancouver. Abbotsford International Airport can be found 50 kilometres (33 miles) from Hemlock Valley. Should you wish to stay nearby, you can easily book a room at the Abbotsford Hotel or the Brookside Inn. What are the most popular Hemlock Valley hotels? Are there hotels in other cities near Hemlock Valley? What other types of accommodations are available in Hemlock Valley? Explore Hemlock Valley with Expedia.ca’s Travel Guides to find the best flights, cars, holiday packages and more!